The Cozumel Thrasher has in the past been considered a subspecies of the Long-billed Thrasher by some authorities (Paynter 1955, Mayr and Short 1970). 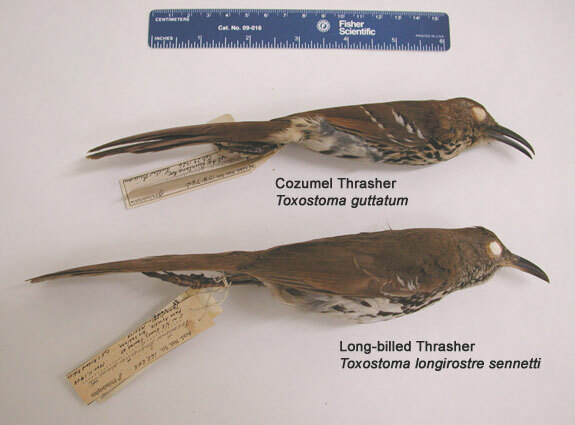 However, the Cozumel Thrasher is currently listed as a distinct species in the AOU Checklist, 7th edition (1998); this assessment is based on Zink et al. (1999), who found T. guttatum to be about 5% genetically different from both T. longirostre and T. rufum. Specimens from the Academy of Natural Sciences, Philadelphia. Photographed by R. L. Curry, 2002.